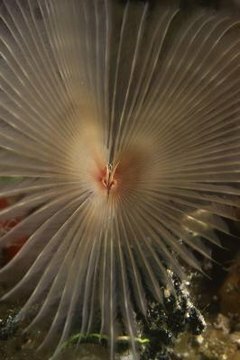 Feather duster worms may not sound glamorous but these marine creatures can often be quite beautiful, with long, flowing appendages of red, green, orange, gray or other colors. These flowery tops are actually clusters of branched tentacles attached to the sides of the worms’ heads and are essential to the worms’ survival. Feather duster worms may be found on their own or in groups, often mixing with other types of sea creatures including coral, other marine worms and anemones. The feather duster worm belongs to the Sabellidae family, commonly known as tubeworms because they live in long, protective tubes they make. Each worm secretes mucus that it uses to build a long, leathery or parchment-like tube that it affixes to rock, coral or another solid surface. Though free-floating in the larval stage, once it makes a home the worm remains in the same place for the rest of its life. When things are safe the worm spreads out its feathery top, but when threatened the worm instantly retreats into its hole to wait for conditions to improve. The appendages that give this worm its name are finely divided tentacles that act as plankton filters. The worm spreads its plumes as widely as possible, catching whatever types of plankton happen to come by. They also wave their tentacles to move the water around them, increasing the odds of catching food. The food is then conveyed from the tentacles into the worm’s mouth. These tentacles have long grooves that get progressively smaller, so that only plankton small enough to eat reaches their mouths. Another tube runs up from the inside of the worms’ bodies to carry away waste. Feather duster worms live in the ocean, often along the rocky shores, on coral reefs or on the pilings of piers. They inhabit a wide range and can be found in the shallow, intertidal areas where they are out of the water at low tide or living at a depth of almost 150 feet, or anywhere in between. These worms do well in turbulent areas, since the wave action tends to stir up plankton, offering the stationary worms more opportunities to catch food. Most sea creatures face constant danger from marine predators, and a hungry fish is sometimes quick enough that it can bite off a piece of the feather duster worm before it can hide. This diminishes the worm’s ability to feed itself, but only temporarily, since these worms are able to regrow missing or damaged parts. Having plenty of tentacles is also important because feather duster worms use them to take in oxygen and release carbon dioxide, so the ability to regenerate missing tentacles quickly helps them keep breathing.